baa ram ewe. army be true. | six words to change the world. ← youtube clip of today: run, emily! baa ram ewe. army be true. Remember how I said I was a thrice failed vegetarian? Besides burgers (mmm…), the other reason for my failure, and I am not joking in the slightest, is the movie Babe. Remember? 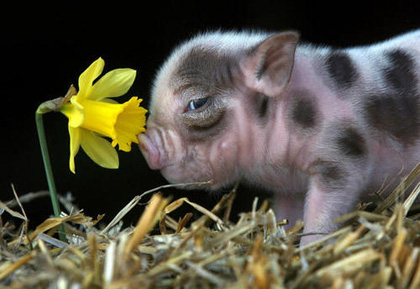 The one with the amazingly cute little pig? If not, I suggest you Netflix that right now. Alas, I wish I was going to continue talking about Babe (which I Google Image searched and did not get what I was looking for…until I put “the pig” after it. Eeek! Haha.). Instead, I’m going to rant a tad. Anyway, if a fictional story about a pig could inspire me to give up meat for over a year, imagine my reaction to this news story: the Army is using pigs as test dummies, shooting at them and then treating their wounds as practice for the field. That’s just cruel! They, of course, say there will be vets around to treat the animals. But they are shooting them with M4 carbines and M16 rifles–I don’t think I could survive that. But the spokesman for the 25th Infantry Division told us that everything is fine, because the pigs are anesthetized. Oh, that’s great. Make these poor creatures dumb with drugs and then shoot at them. Come on! One soldier got upset and then anonymously notified PETA. I think that takes a strong person. Kathy Guillermo, director of PETA’s Laboratory Investigations Department said, “shooting and maiming pigs is outdated as Civil War rifles.” Fact. I do, however, know one Civil War reenactor–and he might take offense to that statement. Sorry! We can’t condemn other nations for human and animal rights violations and then turn around and do something like this. I recognize the need to make our military as strong as can be, but with all the technology and money in the Department of Defense budget (the highest EVER), don’t you think they could come up with a different method? Apparently there are “hi-tech human simulators” out there. Use them. You know how Farmer Hoggett says to Babe, “that’ll do, Pig. That’ll do,” at the end of the day? Well, I think “that’ll do, hi-tech human simulator. That’ll do,” flows just as nicely. And here are a couple of pictures. Just to make your hearts as sappy as my own. That Babe reference really pulls at the ol’ heartstrings. Several million pigs can be slaughtered in a given month, most of which go without medical care and anaesthesia during the process. If this opportunity to practice contributed to a single soldier being saved it would be worth the cost. (I’m assuming pigs are naturally well suited for simulating wounded soldiers). The fact that this is even an issue is a mystery to me. The army’s business is essentially to kill humans; how can the slaughter of a few pigs be deemed meaningful enough to report on? You should be thankful they don’t send Gitmo prisoners in for the Medics to practice on. Oh come on. Although I do agree with the substance of the message, I would never actually say that on this website. Why don’t you find a real cause. Pigs? These pigs probably wouldn’t have an existance if we were not raising them for food, research, gloves, targets and so on. How about fighting hunger. If you don’t like them being shot at then save them from that end and feed a hungry child. Isn’t that what most animals were created for?